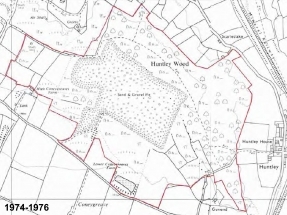 The land here at Huntley Wood was originally a wooded hill. 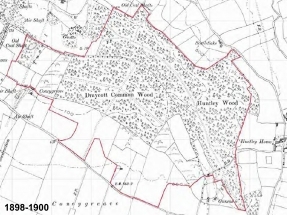 The woodland was divided into two parts; Huntley Wood itself on the north and east slopes, which still exists today, and Draycott Common Wood on the south and west sides, which was cleared to make way for qarrying. 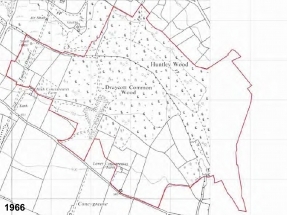 The development of the site from the mid 1800s to the present day can be seen in the maps on the right. 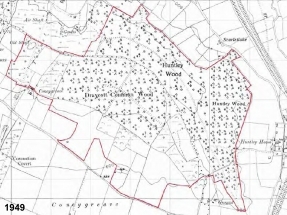 Huntley Wood sits on part of the Cheadle Coalfield and there is evidence in historical maps of small-scale coal mining at the west end of the land here in the late 1800s, which eventually developed into the New Haden Colliery/Draycott Cross Colliery. 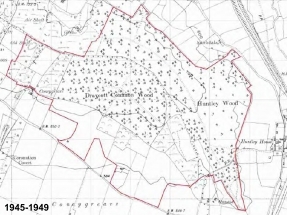 The freight from the colliery, along with passenger traffic to and from the market town of Cheadle, drove the opening of the Cheadle Branch railway line at the end of the 19th Century, as part of which a tunnel was dug beneath what is now the far west end of the site. Unfortunately the tunnel did not prove stable, and despite constant works to improve and repair it, it was eventually closed in 1933, after which further coal mining occurred off the tunnel, using it for access. Although both the tunnel and all the mine shafts are now blocked off for safety, photographs from the tunnel can be found on several subterranean websites (eg here, here, here, here, here, here, here, and many more). In the mid 1900’s much of the site, including the whole of Draycott Common Wood and part of Huntley Wood, was cleared to make way for large-scale sand and gravel quarrying. 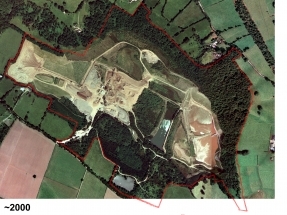 Additional landscaping was done on the south side of the site, to hide the quarrying works from the local area. 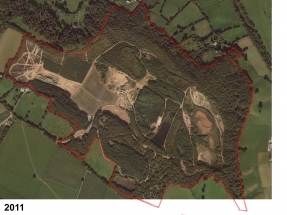 The site passed hands between several large quarrying companies, including ARC Western, Blue Circle and Hansons, before closing in the early 2000’s. 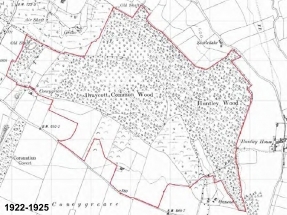 Several short contemporaneous accounts of the quarry’s activity in the mid 1980’s exist on the BBC’s Domesday Reloaded site (see here, here, here and here). 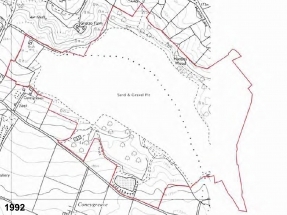 Although subject to a restoration condition, the quarried areas were only partially restored, with several large areas being left as bare sand and gravel. 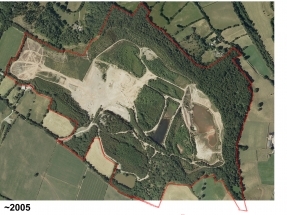 The old quarry was largely abandoned for almost a decade, before being bought by Argoncroft Ltd in 2010. 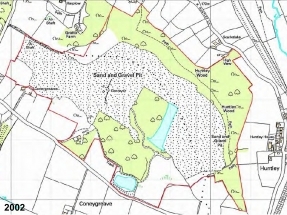 Planning permission was granted in 2011 for change of use to an outdoor event venue, which opened in Spring 2013. 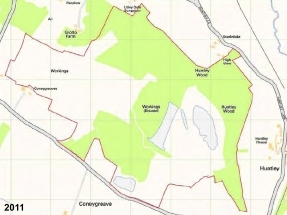 Click on the individual maps below to see a larger version.